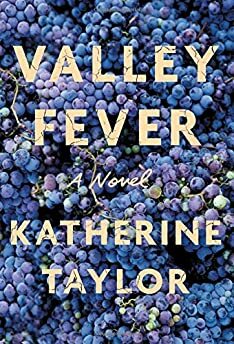 Largehearted Boy: Book Notes - Katherine Taylor "Valley Fever"
Book Notes - Katherine Taylor "Valley Fever"
Katherine Taylor's novel Valley Fever paints a vivid portrait of California's Central Valley, family, and the strong ties between our landscape and lives. "Taylor (Rules for Saying Goodbye, 2007) evokes the rich textures and rhythms of California's Central Valley in this lush novel of inheritance, family, and betrayal . . . [Valley Fever is] a profound novel about forces that can nurture or break the strongest connections." My sound-canceling headphones are so heavily used that the black leather/vinyl cushions have entirely flaked apart. When I put those headphones on, it means: we're really working now, we're not fooling around. When I put those headphones on, it means: if you interrupt me I will kill you. I call them earmuffs. I'm wearing my earmuffs right now. I listen to music on a constant loop as I write, over and over and over so that I don't really hear it, it becomes part of the atmosphere of the book, and something to drive me forward, and something to block out the telephone or my loved ones. Mostly it becomes all white noise, but there are moments when I tune in and listen, so the music must do something for me, and usually what I need it to do is to give me a kick, although sometimes I need it to indulge my melancholy. The best songs can do both. This is a partial list of the songs still on the ten-year-old Valley Fever playlist by the time I finished the novel. It does not include the entire original Into The Woods soundtrack, or selected songs from Jesus Christ Superstar, which were also heavily played. The Valley Fever playlist (and the novel) outlived two computers. This has been on the list since the beginning, the full ten years, and still I'm not tired of it. When I was 17 I performed in a dinner theatre production of Promises, Promises. I like songs I can sing along to, and I've known this one by heart for a long time. (I sing this song in the shower, which my spouse has told me he finds disconcerting.) My protagonist, Ingrid, is a professional at leaving – she's an expert. She's left every place she's lived, every job she's had, every relationship. I imagine she knows this song by heart, too. This one, too, has been on the list a while. While writing the breakup scene at the very beginning of the novel, I lifted the chorus. It's the reason Howard gives for calling things off: “I only love you when I'm drunk.” Thank you, Mika! I'm crazy for pop music. This track outlasted Miley Cyrus's Wrecking Ball, Icona Pop's I Love It, two full Bruno Mars albums, and countless embarrassing others. It cheers me up and reminds me of the kinds of stuff we listened to when we went to those foam parties in Ibiza in 2001 and came home after breakfast. (None of the songs from those early-2000s Ministry of Sound annuals made it on the list, strangely. Maybe I should go back and listen to some Judge Jules.) This song doesn't relate so much to the novel, but I listened to it on repeat the nights I stayed up until dawn to write. I had always been ambivalent about Prince until I saw him in concert. Then my friend Darcy dragged me to one of his 21 nights at the Forum. He's heady; he's absolutely electrifying. Anyone who has seen Prince in concert must get a thrill when they hear him through their earmuffs. There is a lot of Prince on my Valley Fever playlist, but this is (probably) my favorite. You know, you don't have to watch Dynasty to have an attitude. This whole album is so good. There's no redemption in this song, no tidy ending, which I appreciate and which I identified with while writing much of this novel. When I need a little more darkness than usual, I often head toward Amy Winehouse. God, I've been writing this book a long time. This track came from an April 2008 Dreamworks mix my friend Jennifer Hawks used to put together on a monthly basis when she was the queen of music over there. I love it the way I love all poppy music. It's a very closing-the-club down kind of song. This song takes charge, and has a very Ingrid-y feel to it, especially in her later scenes with Felix. Who doesn't wake up and pour themselves a cup of ambition?